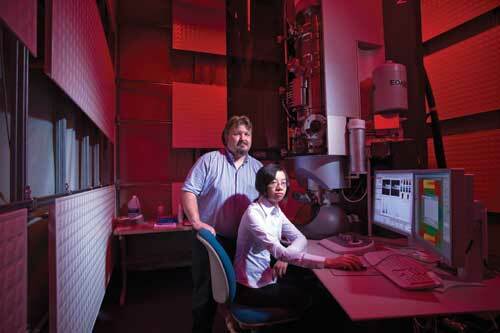 We study the structure of materials using advanced electron microscopy. 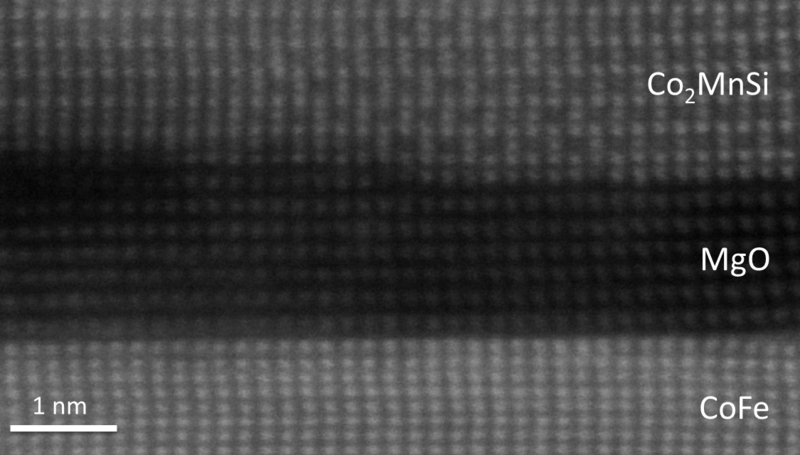 Our two major research themes are (1) studies of the structure of amorphous materials using fluctuation electron microscopy, a technique we have developed based on coherent electron nanodiffraction; and (2) studies of defects and interfaces in crystalline materials and devices using extreme high-resolution imaging and microanalysis. Within these themes, we work on a variety of materials systems, spanning metals, semiconductors, superconductors, and complex oxides, and a variety of functional structures, including nanoelectronic, optoelectronic, and spintronic devices, catalysts, and functional interfaces. We tend to work on fundamental problems in materials science that are related to applications. At the moment, most of our experimental work is done on an aberration-corrected FEI Titan (S)TEM instrument installed in the UW Materials Science Center, in the basement of the Materials Science and Engineering building. This is an exceptional instrument, and one of only a few of its kind installed at a university in the United States. 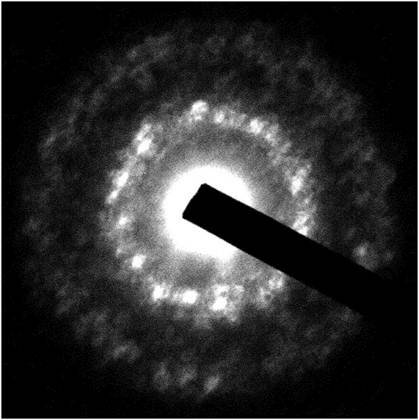 Our STEM is capable of 80 pm spatial resolution imaging, composition mapping by electron energy loss spectroscopy (EELS) and energy-dispersive x-ray spectroscopy (EDS), and has a customized condenser aperture assembly that makes it capable of generating coherent probes for diffraction 0.1 to 1200 nm in diameter. It is installed in a special, high stability laboratory with outstanding control over the lab temperature, electromagnetic fields, and acoustic noise. For openings in the group for graduate students or post-docs, please checking the openings page. Example nanodiffraction pattern from an amorphous material. The bright spots inside the fuzzy rings are called “speckles”, and they indicate the presence of MRO structure. The structure of amorphous or glassy materials is well-defined at the shortest length scale, the distance between two atoms, and at the longest scale, the macroscopic. At the shortest scale, amorphous materials typically have the very close to the same interatomic distances and angles as crystals – both materials are, after all, made up of the same atoms with the same type of interatomic bonds. This kind of structure is called short range order (SRO). At the longest scale, amorphous materials have no structure. This kind of structure is called long-range order (LRO). Crystals have strong, translational LRO. Nor is the “long” in the LRO that amorphous materials lack actually very long – in most glasses, the position of atoms separated by even ten nanometers are completely uncorrelated. The interesting structure (at least to us) and the new science occurs between SRO and LRO. For lack of a better name, this structure is called medium-range order (MRO). In most materials, it covers a length scale of 1-3 nanometers, and it governs the transition from SRO, which glasses have, to LRO, which they don’t. This is also the length scale which governs a variety of materials properties and processes, including crystallization, plastic deformation, electrical conduction, and diffusion. We probe MRO in amorphous materials using fluctuation electron microscopy (FEM). One key idea behind FEM is that probing structure at a length scale of 1 nm is best done with a probe 1 nm in diameter. Matching the probe size to the structural length scale maximizes the signal from interesting MRO structure versus background from the longer-range disorder. The other key idea is separating signal and background by studying spatial fluctuations in diffraction – how the diffracted intensity changes from place to place at the nanometer scale. If all the diffraction from the sample is statistically similar, then the structure is homogeneous and has little MRO. However, if the diffraction varies significantly – has large fluctuations – then the structure is heterogeneous and has significant MRO. Studying the details of the fluctuations lets us determine the size, density, and internal atomic structure of the MRO regions. Our current primary focus of FEM experiments is on the structure of bulk metallic glasses. We have previously used it to show that MRO in the form of proto-crystalline nuclei drives crystallization of some marginal metallic glasses. The frontier of our work with FEM is extending the measurements to study time-domain fluctuations of glass-forming liquids melted inside the STEM. A MTJ consisting of CoFe / MgO / Co2MnSi layers. The termination of the MgO/Co2MnSi interface with Co, Mn, or Si has a large influence on the properties of the device. High-resolution imaging and microanalysis in an aberration-corrected STEM can bring us surprisingly close to the ultimate form of materials characterization: For a given piece of material, measure where all the atoms are in three dimensions, assign an element to every atom, and measure their chemical and electronic configurations. The atom positions come from deep sub-Angstrom resolution imaging, although at this point mostly in the form of two-dimensional images, not three. The elemental information comes from microanalysis by EELS or EDS, which can be done at atomic spatial resolution and, in some cases, single-atom sensitivity. And the electronic information comes from energy-loss near-edge structure (ELNES), another aspect of the EELS signal, which can also be measured one atomic column, and some times one atom, at a time. Our focus in this area has been mostly on electronic materials and devices. Most recently, we have been studying materials and interfaces for spintronics, especially magnetic tunnel junctions (MTJ). A MTJ consists of two ferromagnetic metals separated by an insulating tunnel barrier. The details of the ferromagnet / insulator interfaces down to the level of a single layer of atoms on either side can dominate the fundamental performance of these devices. We have also studied doping of ZnO, and superconducting MgB2. Other areas of current interest include complex oxide interfaces for solid-oxide fuel cells and the structure of heterogeneous nanocatalysts. To support our research in this area, we have an ongoing effort pushing the state of the art in STEM imaging. Most recently, through collaboration with applied mathematicians Peter Binev of the University of South Carolina and Wolfgang Dahmen of RWTH Aachen University, we have demonstrated sub-picometer precision in STEM images. The precision is not the resolution. Resolution means that objects, like atoms, give separate, discernible images. Our images have ~100 pm resolution, which is adequate since the distance between atoms is typically 200 pm or more. Once the atoms are resolve, however, we can determine their position much more accurately than the resolution. 1 pm precision is enough to measure the subtle distortions associated with interfaces, the long-range strain fields from dislocations, and may be enough to let us image point defects and point defect complexes directly.